SA Military Health Service personnel at the North West province ceremony. Earlier this month South Africa’s military medics were on the receiving end of a heartfelt thank you from the North West provincial Department of Health. This was, according to MEC Madoda Sambatha, for the role SA Military Health Service (SAHMS) professionals including doctors, nurses and other healthcare practitioners performed in the province last year when “service delivery disruptions” struck. 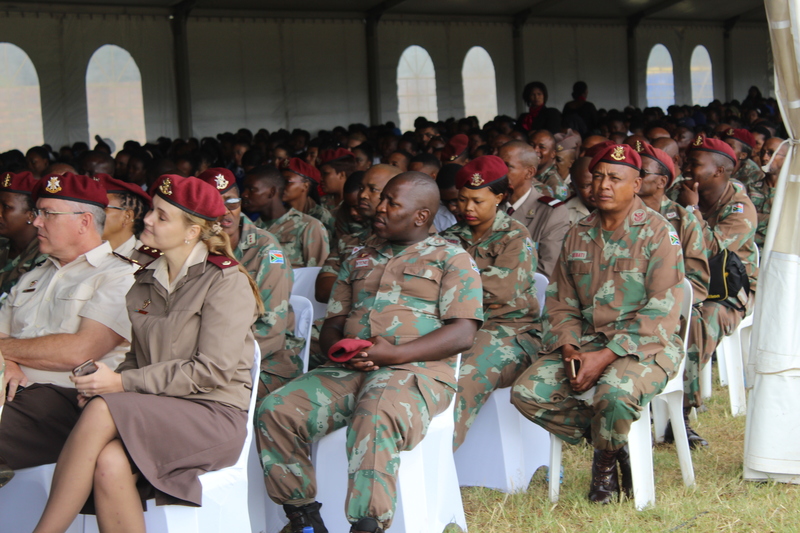 “The intervention of SAMHS brought much relief to the province,” Sambatha said during a thanksgiving ceremony at the Old Bophelong Hospital Sports Grounds. Apart from medical and nursing service, SAMHS personnel ensured the pharmaceutical depot at the Mafikeng Hospital campus was up and running and much-needed prescription and other medicines were delivered to clinics across the province. Security at Mafikeng Hospital, the largest healthcare facility in the province, was taken over by soldiers from 10 SA Infantry Battalion as was security at the hospital’s pharmaceutical depot, the major provincial stockpile of medication. The SAMHS deployment came after strikes and other labour unrest brought healthcare services at Mafikeng Hospital to a virtual standstill. Within a month of being on site, military medics brought the hospital back to full administrative and operational status. Their expertise was not only confined to medical matters as shown by the repair of a faulty dialysis machine, much to the relief of patients needing this specialist kidney treatment. The deployment was under the command of SA National Defence Force (SANDF) Joint Operations North West Joint Tactical Headquarters, led by Colonel Charles Rogers, and initially had a personnel strength of 90. As it neared the end of the deployment period there were 83 personnel at the hospital and two major medicine depots as well as the infantry company providing security. The deployment ended on 30 June. “The hospital has 392 beds and at times military health personnel were helping more than 400 patients a day,” Lieutenant Colonel Piet Paxton, Senior Staff Officer, Operational Communications said when the deployment was underway. By the third week of June last year 22 317 patients had been through the system from registration and admission and, if needed, into either emergency or ward care. The number of casualties treated and assisted in the hospital’s emergency care centre totalled 4 523. On the pharmaceutical side, military pharmacists and assistants dispensed 24 356 items of medication, ranging from packets of tablets and bottles of medicine through to specialist items for specific chronic illnesses and diseases.